Others knocking on the door…Gorilla, Leopard Seal, Orca, Hippo, Wolf, Ocelot, Rhino, Yak, Snow Leopard, Raven, Swift, Polar Bear, Mountain Lion, Beaver and Komodo dragon. “It was just before noon on a recent Sunday morning and a line had formed for the port-a-potties near the Wildflower Trail at Diamond Valley Lake in Riverside County. Cars were backed up around a bend in the road, and frustrated people resorted to parking two miles away and walking in. “They had come to see the ‘super bloom,’ of wildflowers that have sprung up around the trails snaking around this drinking water reservoir. People are excited to take pictures of the flowers and themselves among the flowers, and many areas have been trampled. –Giraffe holds onto the 8 spot after April the Giraffe’s prolonged pregnancy was watched by millions online and she delivered her fourth calf. Jordan Patch, owner of the Animal Adventure Park in Harpursville, New York, said “Everything went absolutely perfect. This is great!” Ka-ching…ka-ching….mused the editor on future ticket sales for Mr. Patch, but that’s OK. Eventually, though, the young giraffe will be moved to another facility for a breeding program. –Bob S. passed along a horrifying story from Mount Pleasant, S.C., which is across the water from Charleston. “Susie Polston had fallen asleep watching ‘Friends’ on television. She woke in the late night to a loud intruder on the porch outside her Mount Pleasant home. This particular alligator had to be euthanized because it wouldn’t budge. –Lots of recent shark attack stories, solidifying the standing of the Great White. 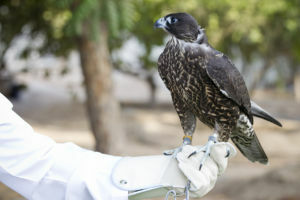 –As for why ‘Peregrine Falcon’ is suddenly No. 10, it has to do with the final episode of BBC America’s “Planet Earth 2,” wherein we learned New York City has the largest nesting population of these cool birds…in the world! Did you know that they can reach speeds of 300 kilometers per hour (186mph)?! Peregrine falcons are thriving in the Big Apple because they love to nest in high towers, or on bridges, and there is quite a food supply (think pigeons and rats). Back in a few weeks with a new list. In other words, the NFL-AFL merger would have gone down quite differently. I introduced the game to a handful of friends, but most shrugged it off, which I understood.